The Health Care Incentives Improvement Institute (HCI3) and the Catalyst for Payment Reform recently released their fourth report card on State Price Transparency Laws. Colorado, Maine, New Hampshire, Vermont and Oregon stand atop the rankings with “A” and “B” grades. Forty-three states, Washington among them, earned an “F” grade for price transparency for the fourth time. 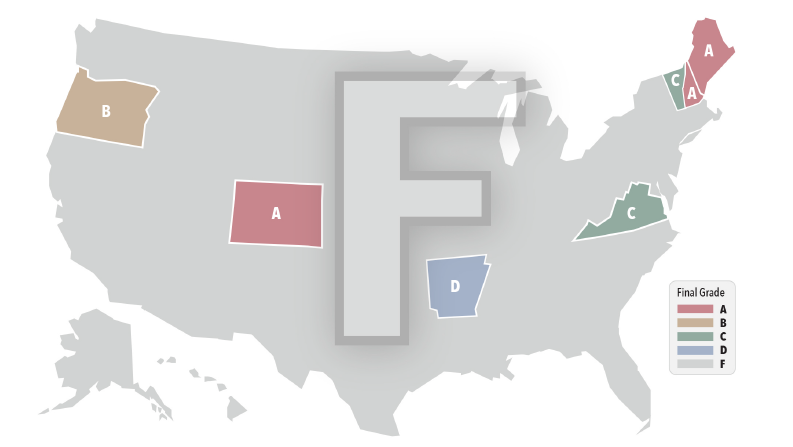 Forty-three states, Washington among them, earned an “F” grade for price transparency. Source: Catalyst for Payment Reform, Report Card on State Price Transparency Laws — July 2016. Yet, in American health care, it is still commonplace for consumers not to have any sense of what a doctor visit, test or procedure will cost them until long after it has happened. It is just as rare for people to have access to pricing information along with quality information, so that they can assess value and make smart choices for themselves or their family members― in other words, so that they can act like a consumer. Out-of-pocket expenses are high and getting higher, especially with more and more plans including deductibles of thousands of dollars. Individuals are foregoing recommended and needed care rather than face an unpredictable health care bill. Value in health care happens when a consumer gets high-quality care and a good patient experience at a fair price. Thanks to the Community Checkup, two of these three components are available to consumers to compare the performance of medical groups and clinics. But it will only be when we can add the third element—price transparency—that consumers will truly be able to shop for value.